The very fact of having taken the time to put together a website means that you are taking the promotion side of your job seriously. I recently attended a writers’ convention where the guest speakers came from three separate publishing houses and a literary agency. All of those professionals agreed during a Q&A session that authors who approach them with a professional-looking website are far more likely to become a part of their clientele. In fact, many of them said that every author they deals with either has a website, or will have one once they’ve had their way with them. Essentially, publishers and agents want you to have a website. Social media sites are a great way to promote yourself online, but the concise nature of their formats means that you can often only link a few of your forms of internet presence together. 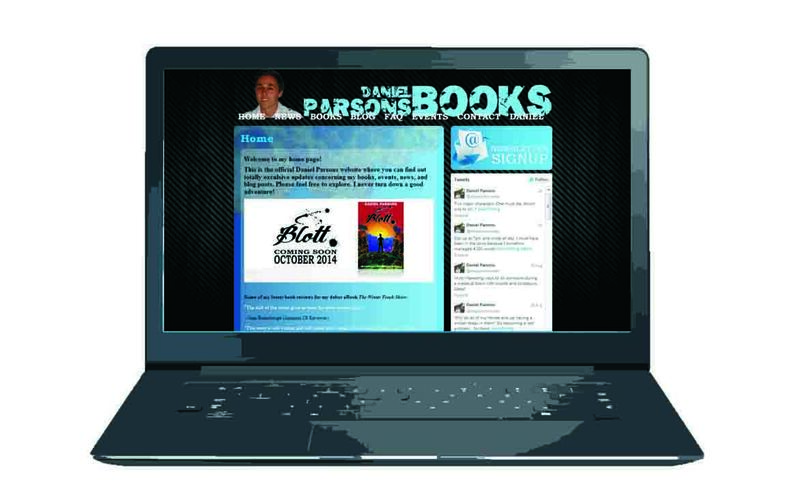 With a website, writers can link together several of their social media pages, as well as the places they sell their books, and their blog. It makes everything more accessible for the writer and any interested readers. How many “aspiring” writers do you know? Probably dozens. Now, how many of them do you consider experts and hang on their every word? I’m guessing that number is a lot less. Social media is awash with millions of people who have either written a book, or are planning to write one in the future. It’s easy to get lost among the white noise as everyone tries to fight for the top, screaming about their book promotions and what they think about the latest publishing changes. Your one little tweet discussing an issue in the publishing world probably isn’t going to be acknowledged or even read amongst the countless others. If everyone is an expert, then that equates to nobody being one. Usually this means that the one with the biggest voice wins. The best way to bypass this issue is by blogging on your own site. Not only – as I’ve mentioned above – does having your own site make you seem more professional, but having a blog means that people will take the time to read what you have to say. There is only one voice on your site – yours. So people will listen. JA Konrath once said in his famous blog, “The Newbie’s Guide to Publishing”, that a lot of people who read his blog are other writers who find his posts entertaining and useful, but do not necessarily buy or read his books. I assume that this is the case generally. However, there are also probably many people who have stumbled across his website looking for advice, only to end up wanting to know how he got his success. They are the sort of people who would buy his books just to see what all of the buzz around him is about. If they enjoyed them, they would then turn into loyal readers. Therefore, a website may not get you as many readers as site hits, but it will inevitably contribute to book sales to some degree. If you type any name into a search engine, you will probably be greeted by hundreds of people who all share the same name. Type in their profession as well – say “author” – and the number will be far less. But a person with a website and up-to-date information will have far more weight behind them in terms of SEO than anyone with only a social media account. It could even get to the first page on Google! For this very reason, a website of your own would draw more eyes to you, raising interest in you as a person, and your books. If you’ve made it this far through my first ever blog post then “thank you!” In the future, I’m planning to write more on the subject of authors, publishing, and the craft of writing, as well as anything else relevant to readers and writers. Feel free to revisit my blog. I hope to see you again. If you enjoyed this post then please share it on all forms of social media. Message me on Twitter at @dkparsonswriter if you have any other suggestions to improve this list in a future blog post.